Aurora Musicalis has made numerous appearances to critical acclaim including concert series’ across the state of North Carolina. 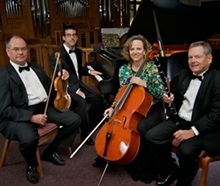 The ensemble was listed in the Top Ten Concerts of 1998 for both the Raleigh News and Observer and The Spectator. Their first compact disc, ECHOES OF AMERICA: CHAMBER MUSIC OF ROBERT WARD, received excellent reviews, including a special notice in the international publication, Fanfare. The disc, whose title piece was commissioned by the Raleigh Chamber Music Guild and dedicated to AURORA MUSICALIS by Pulitzer Prize-winning composer Ward, is available on the Albany label.